Every parent knows the intense frustration when your child refuses to take even a small bite of his or her nutritious dinner–even when it’s filled with things you know they like to eat! It gets worse when your child refuses dinner but then wants a snack before bed, or wakes up in the middle of the night with hunger pangs. Some kids refuse to sit at the table, and want to eat while walking around or doing something else, like watching television. How can you tame the problem? This article may help you on how to get kids to eat dinner. Sometimes it seems like no matter what you did, your kids refuse to eat dinner. How to get kids to eat dinner when they seem determined that they will do things in their way, not yours? Here are some tips that might help you keep them at the dinner table. Some parents believe that if you avoid giving your child a snack in the afternoon, they will be so hungry at dinner that they will eat anything. But the truth is that your toddler's tummy can go into hibernation mode, meaning that they will lose the hunger altogether. Give them an afternoon snack around 3 PM, but make sure it is a very small one. Most of the time, our bodies are programmed to have dinner around 5 PM. That's because we have evolved from people who were accustomed to eating that early before the sun went down in ancient times without light. An earlier dinner in the evening, followed by a light snack before bed, is usually the best way to keep kids eating like they should. Also, noted that it is advised to rest for at least 20 minutes or longer after dinner for both your kids and you. Remember to keep snack times on a set schedule. Right after school lets out is usually the best time to give your child a small snack. If you let your child eat whenever she wants, she will likely eat right before dinner, which means she won't want what you are serving for her. If there is an after-school program or other issue with eating a snack immediately, try giving her something at an earlier time in order to ensure that her tummy stays happy. If your child is still not hungry when you try these things, attempt moving dinner back an hour to see if that helps. Never make something different for your child than what you make for the rest family members. Your child must learn to eat just like everyone else does, or you will soon become more of a restaurant than a family kitchen! If someone in your family has certain dietary needs, try to prepare the same meal for everyone, keeping those needs in mind. If your child doesn't like what is offered, excuse them from the table – but if they come back, they only get their dinner like other family members. Do everything you can to have a healthy family meal together. Sometime, it is impossible to do that, given busy work schedules, but do what you can to make sure your child eats dinner at the same time every day, with an adult with him or her around the table. When those who work late arrive at home, the child can come back to the table and sit with them while they eat dinner. Always make positive comments about the food on your plate, telling your child that this food is delicious, and will help them grow strong and healthy. When your child does eat, praise him for putting such good food into his body. Give him plenty of attention when he does eat, but when he refuses, don’t give him attention, which can show to you kids that you expect the good behavior, not the bad behavior. Sometimes kids are very happy to eat dinner if they help prepare the dinner in some way. Older kids can be asked to help add ingredients or put things in the oven. They can also chop veggies, prepare salads, or do other small things. Smaller children can do things like breaking eggs, sifting flour, setting the table, sprinkling sugar onto cookies and so much more. The more they help, the more they might want to eat the fruits of their labor. 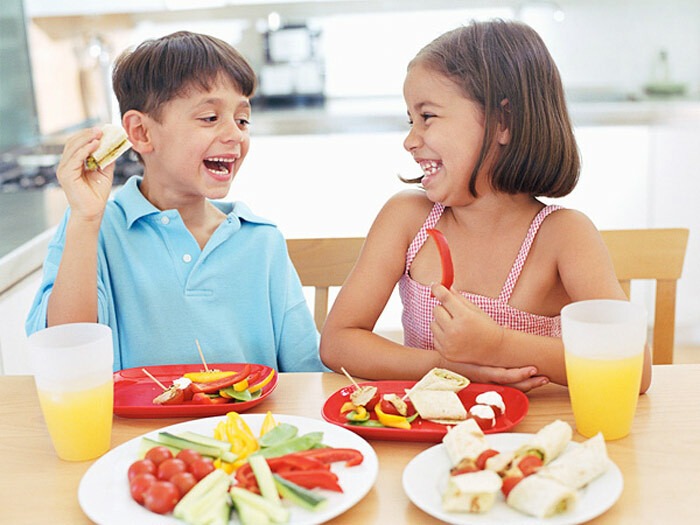 When kids see their friends eating healthy food, it makes them want to eat the same things. Take advantage of this peer pressure when you see one of their friends eating good things, like carrots or celery or anything else that is appropriate for a healthy meal. Remind your kids that their friends eat healthy, and they should do the same thing. Most parents may at least once face the problem that what to make for your kids to eat. It is hard to find a dish that you can enjoy and your kids will eat at the same time. One thing to figure out that you'd better not to make different meals for your family members. Fortunately, you can take some easy recipes from the internet that can satisfy both the picky kids and other family members. Still not sure how to get kids to eat dinner? These experiences from moms who have been facing such an issue can help you figure out how to make your child eat what he is served. "My son had a serious problem with refusing dinner but then wanting a bedtime snack. I began telling him that he had to eat some dinner in order to get that snack. I would offer dinner, and if he chose not to eat it, that was fine – but when it was time for his snack, I offered his dinner again. If he chooses not to eat anything from his dinner then, he goes to bed without a snack. The first few times he threw a fit, and then he cried himself to sleep a few times. But now he eats his dinner without complaint." "My daughter didn't want to eat anything at all for dinner, until the day I asked her to help me mix up the batter for biscuits. It was like magic! She mixed it up, helped me with a few other things, and then she was eager to eat what ‘she’ had made. Now I ask her to help me every night, and she always eats dinner just like she should."